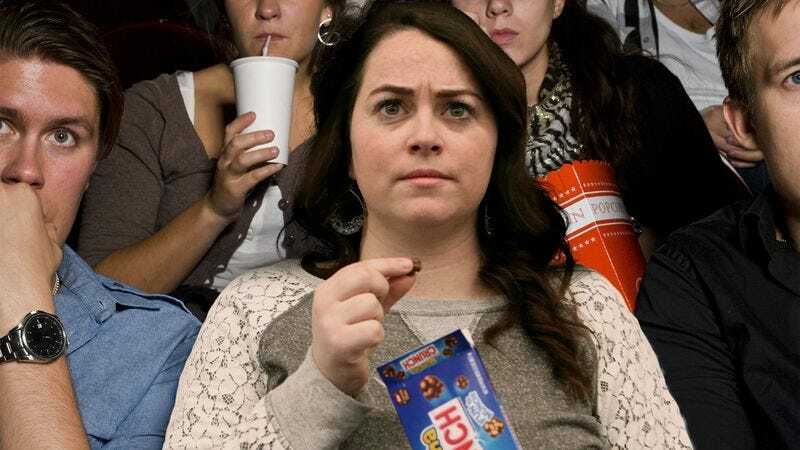 EDINA, MN—Despite thoroughly enjoying the chocolate candy as she watched the film, local woman Jessica Kirby reverently paused from eating Buncha Crunch Thursday during an unsettling scene in American Sniper, sources confirmed. According to reports, Kirby refrained from chewing the bite-size pieces of milk chocolate and crisped rice throughout the tense moment when Bradley Cooper’s character trains his sniper rifle on a small Iraqi boy, respectfully holding the candy in the side of her mouth as the action unfolded on-screen. Sources went on to say, however, that Kirby kept her fingers close to the opening of the Buncha Crunch box in her lap in order to quickly retrieve another piece of chocolate when the camera cut to a less disturbing scene. At press time, Kirby was unsure if she could refrain from drinking her soda for the entirety of the main character’s heartbreaking struggle with post-traumatic stress disorder.